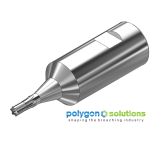 Torx (Hexalobular) Rotary Broach Tools by Polygon Solutions. 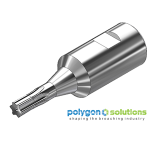 We manufacture precision torx-style rotary broach tools at our facility in Fort Myers, Florida, USA. Most standard size torx rotary broaches are shipped same day when ordered by 4:30PM EST. Please choose the desired shank size below to see our torx rotary broach tools. Our torx broaches are available with a 1/2″ shank diameter x 1-3/4″ overall length, 8mm shank diameter x 1-1/4″ overall length or 8mm shank diameter x 28mm overall length. 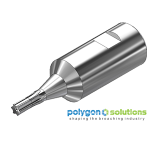 Polygon Solutions’ hexalobular rotary broaches are precision ground with a tolerance of +0/-.0005. Each nominal size conforms to the industry standard – ANSI B18.3 2003. All torx rotary broaches can be made from M-2, PM M-4, PM T-15 or M-42. For rotary broaching tougher material or longer tool life, coatings such as TiN, TiCN, TiAlN or Punch Coating can be added to any torx rotary broach.